we think it must be nice. Another little ditty for Magaly Guerrero’s prompt on Real Toads about not trusting the cannibal. 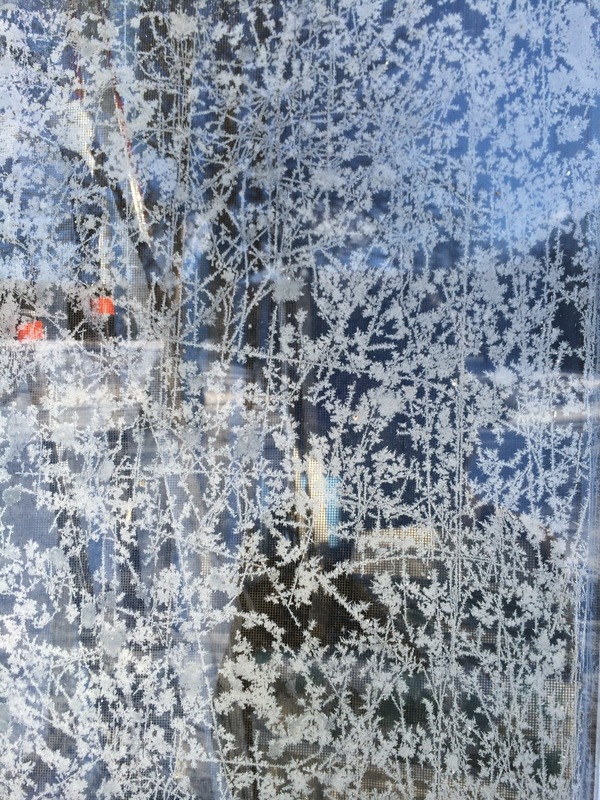 It was 22 below this morning but this pic is from last year (though similar frost appeared this morning –I just didn’t get a pic.) This has been edited slightly since first posting. This entry was posted on February 14, 2016 at 6:20 pm and is filed under poetry. You can subscribe via RSS 2.0 feed to this post's comments. This one sinks all the way into my bones. The sun was bright today, so very bright… and my bedroom is surrounded by huge windows. It was so warm inside that I had to just walk out to the terrace in my bathrobe… I nearly froze! But it was sooo pretty. exactly! this was our day too. Your fifth stanza really says it for me…I agree and I don’t know how people function in this kind of cold long-term. It’s definitely a test of endurance. Love the ” we trek loggily/glasses so foggily” Me, too…we burn wood and I wear glasses also. Welcome to Climate Change, Ms. K. I predict that the trend, seasonal hot and cold swings, is to be worse, more extreme, than the year before. Really hard on wild life, about the hardest on Polar Bears. My car thermometer hit 80F outside today. The guy ahead of me in church this morning was wearing shorts (and driving his Porsche-his wife wasn’t there, she was staying with a sick grandchild). Your poem also reminded me of the old W. C. Fields movie, “The fatal glass of beer” where he comes in from the cold saying, “It ain’t fit out for man nor beast.” All the time Fields was shivering and shaking off the snow. BTW, when I moved to Houston I left my snow shovel in New Hampshire. I had already left another in Nebraska when I moved to El Paso before New Hampshire. The imagery is as delicate as the frost you illustrate it with, k–the dangling breaths, the sense of self suspended in a cold so profound it becomes an element like air or water, pulling, surrounding, changing…and of course, full of rich, if freezing, metaphor. Sometimes our planet seems a hostile place indeed, though we are lulled by its variety and beauty. I say as my father once said… bless the hollowness of houses..